It's amazing what you learn when you do a little research. 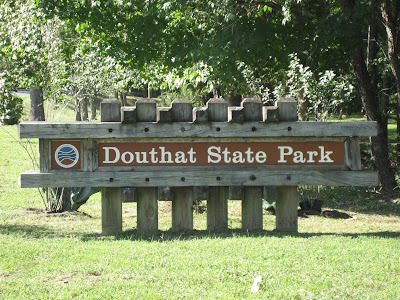 I had never heard of Douthat State Park but it looks like a fun place to visit. Listed on the National Register of Historic Places for the role its design played in the development of parks nationwide, Douthat State Park has been around since 1936. It was one of the six original Virginia parks opened in that year. Nestled in the Allegheny Mountains, Douthat State Park offers mountain scenery, boating, swimming, and fishing in the 50 acre lake, lodging varying from lodges to cabins to tent and trailer camping, and 43 miles of hiking, mountain biking, and bridle trails. A lovely place for a family vacation. That cabin looks like something I would like to do. Plus the park is quite pretty. Right up my alley.